What are you expecting from the Geneva-2 conference? At this conference there won’t be a place for the will of the Syrian people. It is enough that the Syrians aren’t choosing the delegations that will participate in the conference. 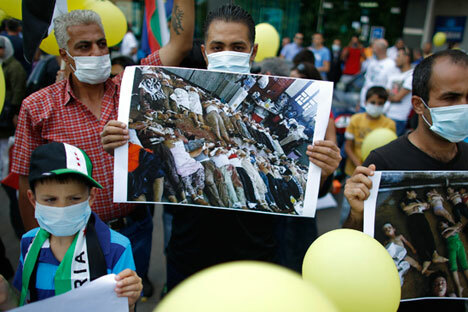 The Syrians have lost the right to determine their own fate because the conflict has permeated the international arena. However, resolving the Syrian crisis without international consensus is impossible. At the moment, no Syrian faction has the choice but to accept this “internationalization” even though the solution will be tailored to fit the international actors, not the Syrian ones. Geneva-2 will give the world community the chance to focus on resolving the Syrian crisis, not merely supporting one of the warring factions. The mission of Geneva-2 is to shift the Syrian crisis from its military course to a political one. This could open the door to civil society so it asserts itself and becomes a key player in Syria’s reconstruction process. Are you afraid that Syria’s interests don’t concern the international community? Right now, a return to stability and security in Syria is in the interests of most sides, except for the extremists, who are profiting from the continuing bloodshed. Will the world powers be able to go from supporting factions in the conflict to resolving the conflict? Russia has always backed the regime, which, despite problems, has still remained more unified than the opposition forces. The United States has been assisting the opposition, whose ranks are divided, and this has become a problem for Washington. The Obama administration tried to change the situation by providing military aid to the moderate opposition, then by threatening intervention, but in the end it needed to accept the Russian initiative. All in all, the American position is characterized by a lack of clear political strategy and an inability to understand all the intricacies of the Syrian reality. Having said that, in his speech at the United Nations Obama discussed America’s exceptional role. . . . It is not in the world community’s interests for someone to make a decision on its behalf or to become a global police force. History, especially when it comes to wars in which America has become entangled, has shown that the community dissolves after the military intervention and how this results in prolonged and destructive conflicts. What worries us now as Syrians is the next stage of the American-Russian cooperation: will Russia manage to compel the Syrian regime to make concessions for the sake of a political resolution? Until now, everybody has been limiting themselves to the eradication of chemical weapons. However, these weapons have only recently become a part of the Syrian conflict. And it will never be enough for the regime to cooperate in destroying chemical arms in order for us to believe that this is a confirmation of its readiness to move toward a political resolution. Can Russia force the regime to make concessions without an agreement with the United States? A Russian-American consensus makes it possible for both sides to go from supporting one particular side in the conflict to supporting a resolution itself and to supporting the coalition that needs to emerge after the Geneva-2 conference. This will make Russia’s role acceptable for most of the Syrian factions, not just for the regime. Other than the regime, what forces can Russia depend on during the resolution process? Russia can count on Syrian civil society. The presence of representatives of civil society at Geneva-2 is crucial for the overall success of the conference. Indeed, Syrian civil society is best equipped to express the hopes of the Syrian people and to supply the Syrians’ perspective without polarizing opinions. The participation of civil society representatives in the talks and in the transition period is vital for this process to succeed. Rim Turkmani is a civil society activist and director of Madani (http://madanisyria.com/), an organization that works on developing civil society in Syria.